Thursdays demonstration. 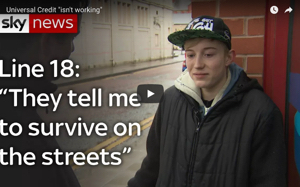 Claimant turned away from the Jobcentre because he was two minutes early. Thursday was our regular demo day and it was freezing. Despite the weather we had a good turn out and we handed six food parcels out as well as packs of toiletries that had been kindly donated. These are essential because when you have no money they aren’t a priority, food and keeping warm is. So these are always warmly welcome. We spoke to many people and offered solidarity, advice and signposted everyone that needed to be signposted. Like I have mentioned before, Christmas is not a joyful time for many so seeing a friendly face really makes a big difference. We spoke to a man, whom we had noticed had been walking in and out of the building. A member of the team asked him what was wrong? Why all the visits? He stated that they had turned him away because he was two minutes early. Yes two minutes. Come on Ashton Under Lyne Jobcentre, this is just petty. I feel this was done to humiliate the poor man, to remind him of where his place where they are regarded truly is. Some people reading this might think that this is nothing, not a big deal, but it is a big deal. It humiliates the person concerned and strips a person of any self worth that they might have had left. Indeed, I see it as a kind of mental abuse, although some might think I am extreme saying this but I don’t think so. As a survivor of domestic violence it reminds me of something my ex partner used to do to me. Things like this still need to be tackled, because they are part of the much bigger issue and they always lead to more unfair treatment by the DWP. It was a very peaceful demo as usual, we exchanged cards, hugs, food, compassion and solidarity. This is the true meaning of Christmas. We will be back next Thursday because the Jobcentre will be open and people will still need help. I want to thank everyone who has supported us this year, and the past years. You all mean so much. We’ve seen this grow into a much bigger movement which is amazing. I’m not sure how I would have managed without the support of my readers, comrades and friends who are always there when I need them. I have had a few moments this year when I didnt know how I would manage, or when I have been so upset because of a persons treatment by the DWP. I also apologise if I don’t respond in time. I’m very busy and that does reflect in my response to emails etc. So a massive thank you from myself and the team who are amazing. I keep saying this, but they are. I hope that those who are celebrating Christmas have a lovely time, and for those who aren’t, just try and take it a day at a time and cope in whatever way you feel that you can do. Last year I avoided everything Christmas and it helped lots. Please donate if you can, if not please share. It’s so important that we continue to raise awareness, give support and continue. Ashton Under Lyne must surely be the most petty and ridiculous Jobcentre in the UK. In my local southwest jobcentre people just go in and sit down to wait for their turn, 10 or 15 mins early. No problem. There is not some idiot with a stopwatch timing them. We have a sign in the jobcentre which says that if customers have been waiting more than 10 minutes, they should contact reception. This is really just to make sure that the Work Coaches don’t get behind schedule as much as anything. It just goes to show that things really are tougher up north. I have to agree! Oh yours sounds fantastic it really does. Ours are horrific! I’m lucky to be dealing with the staff at the Cromer Jobcentre. They know that I suffer from various mental health issues so they’ve virtually bent over backwards to make my experience as bearable as possible – including allowing plenty of time to settle down if I’ve has a panic attack on the way up. My job center gave me an appointment for 8.45am. I arrived well before that time to make sure i wasn’t late and the place was shut. Sign on the door said they open at 9am. I stood in the cold until finally some security guy opened the door and i went in. I then sat in the waiting area for my name to be called. Eventually the advisor called me over and the first thing she said was ” why are you late?”. I told her my appointment was for 8.45am and she sarcastically said ” don’t be silly we’re not open at that time, your appointment was for 9am and it’s now almost quarter past 9 “. I then said ” i came in at 9 when the door was opened and i’ve been waiting for you” which she didn’t like eventhough it was true. She then hummed and harred and said ” well just remember in future if you’re late you can end up getting sanctioned”. So instead of having the common sense and decency to apologise she just had to give me a thinnly veiled threat of destitution if i didn’t pipe down. Then they wonder why people commit suicide having to deal with this kind of bullying and redicule. Just to make sure i hadn’t made a mistake i went home and checked my letter and it definately said 8.45am, it makes you wonder if they are woefully incompetent or just vindictive. That’s appalling. I actually think that they are both! No one deserves to be treated like this!!! 2 minutes early, I can’t relate how this enrages me! it’s sick, cruel and so unnecessary. It really is. It’s certainly a form of abuse. These “little” incidences (which arent little at all) build up into much bigger things. It’s intolerable that this is happening at all. What is happening to this country? Where is its soul? Keep up the fantastic work you’re doing, you may not have stopped the jobcenter lot (yet) but you have provided people with support and knowledge that they are not alone, which that on its own can make a big difference. The jobcenter I had go to here for a work focused interview (even though it was obvious I couldn’t work), the person I saw didn’t seem to understand why I had this interview and wrote a written letter of complaint to the call center. Back ground info to this is, I was in hospital attached to drips, having IVs and physio, etc. and my partner phoned to let them know and asked for a new date, they refused and just repeated “it is regardless of the reason”. But like I said, the person (and her co-workers) did not look pleased and complained. So I guess there are still some decent ones out there, it’s just they are becoming rarer. As a retired JCP adviser I am a shocked to read about Ashton under Lyme Jobcentre, how can anyone be so petty when they are supposed to be helping people. Didn’t I read somewhere that the sanctioning policy has been completely ineffective in getting people into work? I never sanctioned anyone but got plenty of people into work. What sort of job satisfaction is there in bullying people? 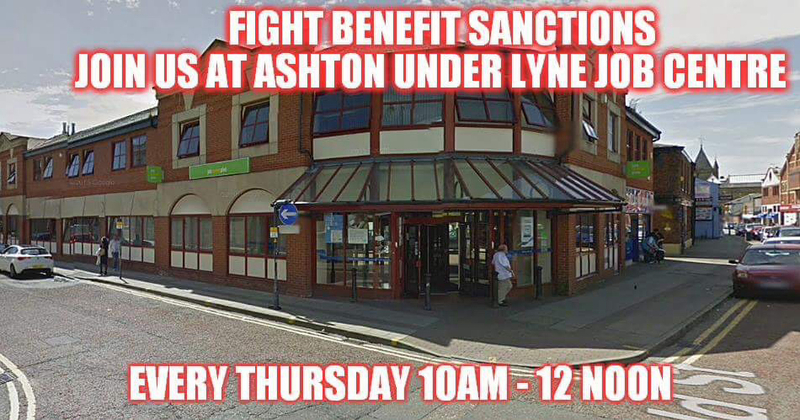 Ashton under Lyme must be the worst Jobcentre to work in as well as to attend. I used to go to the job centre and say a course they had sent me on was an exam today and was told by the person doing the course to go and sign on if it is your signing on day as the exam starts at 10:45 only once did they refuse so I went outside got the number for the job centre phoned it and asked for the manager they said he wasn’t available so I said just tell the tw@t I am going to be issuing court papers against the job centre and DWP and the company that they sent me on a course to for fraudulently saying I would be able to sign on if I told them the reason why, they interrupted and said hold on he’s available now! I told him simply I was turned away when the person running the course said people would be able to sign on if the exam clashed with a signing on time and said reasonable excuse so court papers are landing in your inbox overnight. he said try and make it in today at anytime if you can if not first thing in the morning will be fine and there should be no problems. I made it in there 10 minutes before it closed and they sent me to a desk that they sent everyone who was late, I was only 110 minutes late, he said what’s your excuse for turning up late? my reply was GET ME THE FECKING MANAGER NOW! I was shouting that loud the whole centre was looking at me, even the security guard backed off, the manager came and 30 seconds later I had signed and was on my way out.